Don't some of us, sometimes, hang up on an annoying telemarketer and carry over the frown to the innocent one demanding a snack? Or nod in affirmation to an interrogative from the little one while we are pensive or depressed. Or realize we just said yes to using the permanent marker while we were busy playing back in our head an incident from work! For a multitude of reasons, and sometimes not involving kids, we just don't seem to be our usual selves. And to make it worse, we are made to realize this by our own children. Picture books are wonderful when the child can relate to it. This book accomplishes that and more - it actually makes the parent and child exchange perspectives. While it can be difficult to see how parental moods impact children, it can also be important for children to see how it can be a struggle for parents to suppress situational emotions and act normal. I fell in love with the stick-figured illustrations in crayon coloring, outlined and framed with sharpened color pencils I suppose. It complements the child-centric incident with ease. The text, kept simple and casual, works in unison as well. For the issue dealt in this book, I would imagine it would be hard to stay away from a serious tone or a counseling approach. But neither happens here. The text, font inclusive, works well with the voice and mind of a child. She burned the toast. She banged the pots and pans. And she forgot to kiss Daddy good-bye. 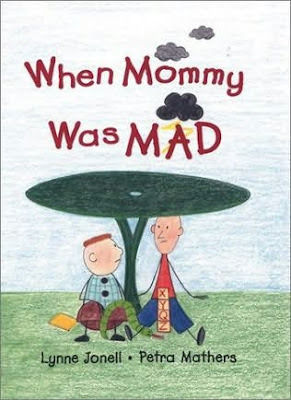 The book introduces Mom as not being in her usual mood. And her boys Robbie and Christopher are quick to sense that. The little ones are often the first to sense and react to aberrations in the household. And this book lightheartedly discusses the discomfort that children face when parents are just different at certain times or certain days. Now, Robbie, the younger one, questions his own behavior. Guilt is one of the primary emotions. Having crossed that out, Robbie and Christopher try to impress Mom, who still seems retracted. The boys are confounded. After a while, Robbie gets frustrated and turns cranky himself. Mom's mood is rubbing off on him. But not for long - his funny ways finally win Mom over. She smiles and jokes - Mom is back! She even plants that overdue kiss on Dad when he walks in sullen that evening. More of Robbie can be found here, on Lynne Jonell's website here. A different perspective on an unusual but very relevant topic. Hmm.. makes me introspect. Good find and a very well-written review! Wonderful review Meera. As Arundhati writes, I guess this makes all the mothers introspect a little. Sometimes we fail to register how much our moods impact our kids. Thanks for this great review, Meera. Picture Books are a wonderful way of inculcating a reading habit in a child. Wishing all the contributors of Saffron Tree a Merry Christmas and a wonderful New Year. 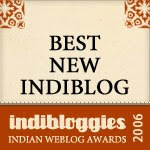 @Rachna: Thank you! Xmas and New Year wishes to you as well. Okay - project for tomorrow for the kids - make a book of the same title! "She banged the pots and pans"(and babbled loudly in her alien language for a good measure) are the signs kids have learnt to recognize and warn each other of the monster rising... which thankfully helps me catch it in time (most of the time). Thanks for bringing many such books (I treasure the School cluster) that help deal with emotions as we (and our kids) go through these phases. So true! So many times when a bewildered child has wondered why she was scolded. Thank you for holding up this mirror to us, Meera! Will look out for this book. Sheels, very pleased to know the reviews are helpful.